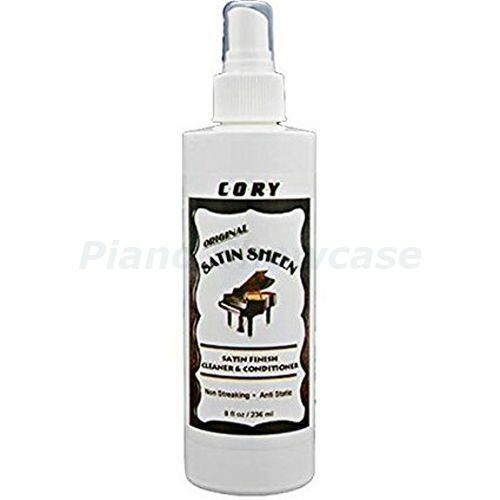 Satin Sheen is a Cleaner / Conditioner for all Satin finish pianos. Ordinary cleaners can leave a wax build up on your instrument. Satin Sheen’s remarkable cleaning properties make maintaining difficult satin finishes easy. Use Satin Sheen to remove fingerprints, smudges or grime. Super Satin works on poly as well as lacquer surfaces. Nothing cleans the new polyester satin ebony better or easier. Simply apply directly to surface, rub in the direction of the grain, and buff off. 1443A - Cleaner Cloth A soft thick weave, non-treated flannel cloth for applying Key-Brite cleaner and Buff Brite. 1443B- Polisher Cloth A special smooth, thick weave, non-treated flannel polishing cloth for application of all these fine polishes. No returns on liquids or paints.